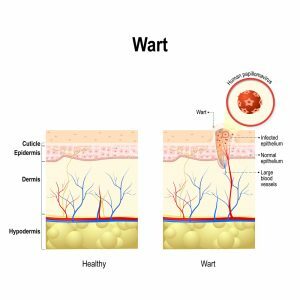 Warts are skin growths that appear when the human papillomavirus (HPV) infects the top layer of the skin. Wart viruses are contagious and can spread by contact with the wart or something that touched the wart. Often warts are skin colored and feel rough, but they can be dark (brown or gray-black), flat and smooth. Cantharidin: Applying Cantharidin to the wart causes a blister to form under the wart and then the wart on top dies and may be removed. Cryotherapy: Cryotherapy (freezing) is the most common treatment. It is common to need repeat treatments. Electrosurgery and Curettage: Electrosurgery burns the wart off and curettage involves scraping off (curetting) the wart with a sharp knife or a small, spoon-shaped tool. Often a combination of these two procedures is used. Laser Treatment: The wart is put under a very focused beam of a particular dermatological laser. 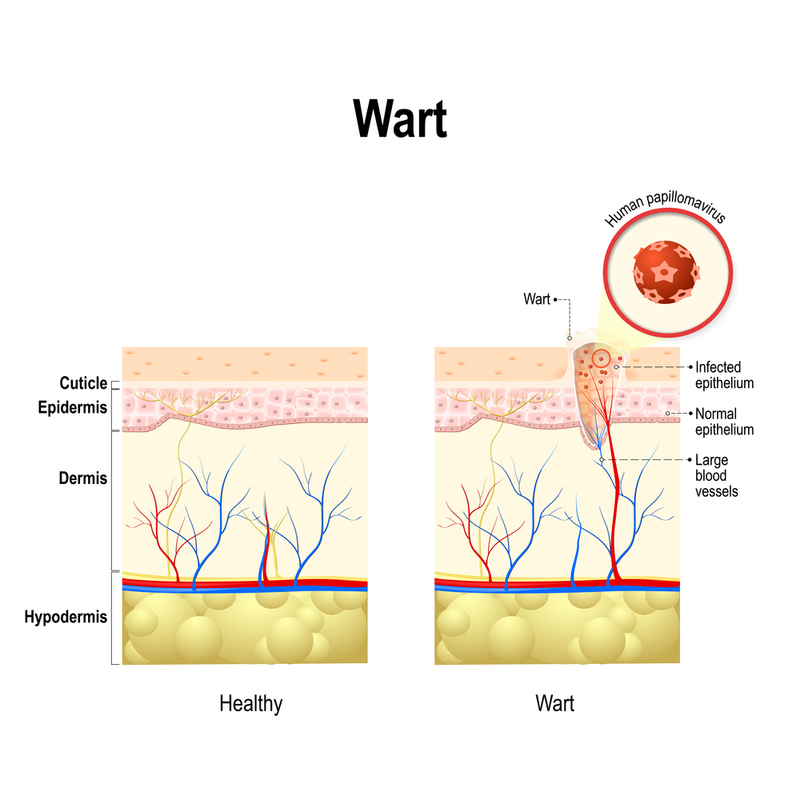 The light heats up the blood in the vessels inside the wart and destroys them, thus killing the wart. Chemical Peels: This treatment involves applying a peeling medicine to an area of the skin — typically one with multiple flat warts. Chemotherapy Medicine: In certain circumstances the dermatologist may use an injection to the wart of a particular chemotherapy drug, such as bleomycin. Immunotherapy: There are multiple types of immunotherapy and this treatment is typically used as a last alternative to get rid of stubborn warts. Most often on the soles (plantar surface) of the feet. May grow in clusters (mosaic warts). Are typically flat or grow inward. May be painful when walking. Black dots may appear in center of warts. They appear most often on the fingers, around the nails, and on the backs of the hands. If you suspect a wart on your or your child’s face, check the hands for warts. The virus that causes warts can spread from the hands to the face through contact. Common warts often grow where skin was broken, such as from biting fingernails or picking at hangnails. May have black dots that look like seeds (often called “seed” warts). May grow on any part of the body. Children typically get them on the face. Men typically get them in the beard area. Women typically find them growing on the leg area. These warts are smaller and smoother than other types of warts. They tend to grow in bunches, up to 20 or more at a time. Filiform warts look like long threads that stick out. They often grow around the mouth, nose or eyes. A weakened immune system often accompanies these warts, such as in as case of a person with HIV.